Yesterday afternoon was abuzz with excitement as the app's top 6 scorers competed with each other for a chance to win cash prizes and gift certificates from Goldilocks. Goldilocks first interactive smartphone app was launched last month as part of Goldilocks 50th anniversary festivities. This free application uses revolutionary augmented reality software which makes use of one's smartphone camera for an added gaming experience. To play, you simply have to scan the Goldilocks 50th Anniversary logo featured on in-store posters, which will then become an actual cake on your phone. You then need to defend your cake against ants that want to take a piece from it. 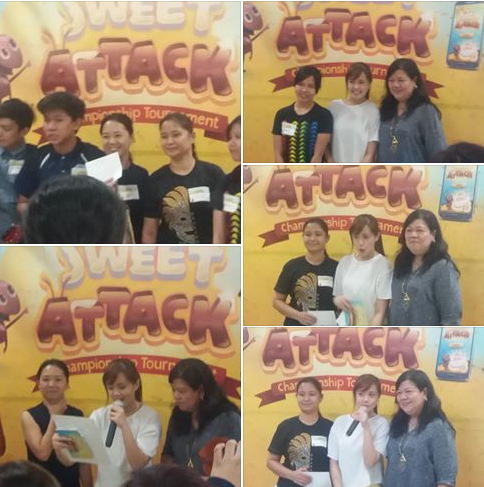 During the recently concluded Sweet Attack Battle Tournament, the app’s top 6 highest scorers from the period November 7 to December 4, 2016 were invited to join in the culminating activity held at Goldilocks SM Megamall on December 8, 2016. Three males and three femaled compete among themselves for the chance to win cash prizes and gift certificates from Goldilocks. They moved quickly across the screen stopping the ants! Each aimed at clearing out the upper row immediately to score big. Players aims for the golden ants which cross the top of the screen to get bonus. In the end, Joan Muhi outwitted her competitors with her quick hands and a winning strategy. The other three players received a consolation prize of P 1,000-worth of Goldilocks GCs each. 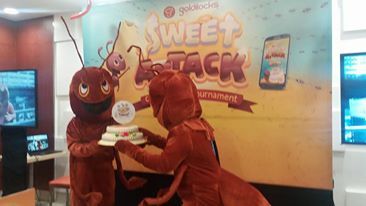 Try out the #GoldilocksSweetAttack app now! You might be the next champion.